@entrepreneur.ge Gamarjoba! I’m the Editor-in-Chief of the Georgian edition of Entrepreneur magazine and I’m here to share the top weekly Entrepreneurial news with you: Another success for Georgian wine! The London market has expressed interest in particular wines of ‘Marani Kapistoni’. Company founder Nika Chochiashvili took on wine production to continue his grandfather’s traditional business, but he went into it knowing that due to the rareness of the grape varieties, ideal for higher price ranges, the products would be best for foreign markets. The business was launched with government grants, aiming to promote nearly extinct grape varieties. Currently, negotiations are ongoing with English businessmen, and interest has also been expressed by other countries. and structural reforms. The International Monetary Fund as always will continue to support. We are pleased that our cooperation, including the IMF program, is going well.” The meeting was attended by the President of the National Bank, Koba Gvenetadze, Vice President of the Bank Archil Mestvirishvili, Deputy Finance Minister Giorgi Kakauridze and Nikoloz Gagua, David Bakradze, Ambassador of Georgia to the United States. The ISET Policy Institute (ISET-PI, www.iset-pi.ge) is an independent think-tank associated with the International School of Economics at TSU (ISET). Our blog carries economic analysis of current events and policies in Georgia and the South Caucasus region ranging from agriculture, to economic growth, energy, labor markets and the nexus of economics, culture and religion. Thought-provoking and fun to read, our blog posts are written by international faculty teaching at ISET and recent graduates representing the new generation of Georgian, Azerbaijani and Armenian economists. – real growth in agriculture was modest in 2018 (+0.7%) after a sharp decline in 2017 (-3.8%). While such numbers might destroy optimism about this sector, other countries have also had similar experiences. For example, the Indian government subsidizes farmers by various means, but nevertheless experts are talking about the deepening crisis in agriculture in India. According to an article in The Economist, the main reason for this crisis is the fragmentation of land, wherein average land size per holding has been shrinking since the 1960’s and today amounts to 1.1 hectare. Not surprisingly, one of the fundamental problems (“root causes”) holding back the development of agriculture in Georgia is the fragmentation of land parcels. LAND REGISTRATION – A PROPER START AT FIXING THE ROOT CAUSE There are various factors hindering Georgia’s land consolidation, but first and foremost is the incompleteness of land registration. According to recent data from the Public Registry, only 45% of land in Georgia is registered, although many attempts have been made over the last three decades. So, what holds back land registration in Georgia? and economic problems. The political leaders of that time decided that the best way to fight against the deep crisis was to distribute land among the rural population of Georgia. As a result, hundreds of thousands of subsistence farmers were created with an average landholding of slightly over 1 hectare (this land was often divided into 3-4 parcels). The remaining state-owned land was leased out. Therefore, the total number of land parcels amounted to about 2,500,000(! ), even excluding Adjara and the mountainous regions, where land reform was not implemented at that time. It may be true that many families survived hunger at that time because of subsistence farming, but today land fragmentation is one of the most severe challenges to agriculture in Georgia. At the end of the 90s, the land registration process started, which continued until 2004. This process was lacking an entire cadaster system and legal documents were based on the maps existing in the villages and municipalities. The formal registration of land with cadaster started in 2008; until 2016, about 35% of land was registered. ship. The current reform uses sporadic as well as systematic registration approaches, but the major focus is on sporadic registration. The major difference between these two approaches is that while sporadic registration depends on the goodwill of the landowners to register their land, in the case of systematic registration, the government approaches the landowners and registers their land. Systematic registration has only been piloted in a few settlements across Georgia. According to the findings of ISET’s Research on Land Registration conducted in 2018, although some incentives are provided by the current land registration reform, many private landholders are not interested in registering their land. The main reasons for this include: fear of losing social allowance, fear of losing (registered) land to credit authorities, fear of land taxation, disputes about demarcation of land, traditional view that land belongs to the household and does not need to be registered, absence of landholders in the country or in the region (migration), lack of finances, and lack of information about the land registration reform. Completing the registration of land and developing modern land systems can support not only the land consolidation process, but can be beneficial for various means: security of tenure, certainty of ownership, facilitated land reform, improved land resource management, reduction of land disputes, stimulation of the land market, increased land taxation, credit security, improved land market monitoring, improved management of state lands, improved spatial land-use planning, improved agro statistics, and usage of agricultural potential (International Land Systems, 2009). SM, representing one of the world’s leading and most powerful audit, tax and consulting networks uniting firms in over 116 countries, up to 750 offices and 41,000 professionals around the world, has recently welcomed a new partner, Giorgi Tabuashvili, Tax and Government Compliance, to its Georgian branch. GEORGIA TODAY met Tabuashvili to discover his path to success and plans for the future. “I joined the RSM team in March,” Tabuashvili tells us. “I’ve been operating in government agencies, private companies and international financial institutions, and participating in various projects, for more than 20 years. I’d say 2002 was the turning point in my career, the time I returned to Georgia after doing a Master’s Degree in Economics at the University of Illinois at Urbana-Champaign in the USA. I came back to Georgia and started working in the International Monetary Fund (IMF) in the position of Fiscal Economist.” We asked Tabuashvili more about his studies abroad and the affect it had on his personal life and career. “I can firmly state that doing the studies abroad played an incredible role in my success for various reasons. First of all, at university I obtained valuable academic knowledge and became an expert in my field. However, it is not the only good reason to travel thousands of kilometers from your homeland. While getting an education overseas, you acquire new experiences, meet new people and discover new cultures. In addition, your ability to make decisions independent and your self-confidence rocket, contributing to the formation of you as an individual, which is certainly paramount. After receiving a foreign education, you return with a new spirit and a developed global outlook. It is vital to live in that environ and be fully involved in that rhythm and lifestyle,” says Tabuashvili. “In my case, I had a chance to explore the USA, the Western World and their civilization, which as a result facilitated communication with foreign partners.” We asked him how he had managed to succeed in such a significant and difficult field. A number of important reforms were implemented the time I was working in the public sector “Even though I had worked in the public sector, including Parliament, the Ministry of Economy, USAID Programs, and had been one of the founders of the Association of Young Economists of Georgia (NGO) before 2002, working at the IMF has proved to be very fruitful for my further progress. I have changed a number of workplaces since then. For several years I have been working at the Ministry of Finance of Georgia, as well as Georgian Oil and Gas Corporation LLC and Policy and Management Consulting Group LLC (PMCG). From 2014 to 2018, I occupied the position of Director General at the Revenue Service of Georgia,” Tabuashvili tells us. We were intrigued to find out whether operating in the private or public sector was more interesting for the new Partner of RSM. “It would be very difficult to answer this question and outline just one sphere I liked working in. There were times when I was sure that working in the government agencies would be better for me and my role towards the development of the country. I am happy to say that a number of important reforms that greatly contributed to the establishment of the well-developed system in Georgia, were implemented the time I was working in the public sector. Various international institutions have noted the progress of our country regarding the innovative reforms carried out in recent years. It makes me proud to know that I have been involved in this process. We have also put a lot of effort into developing the accounting, auditing, and financial reporting fields and establishing an appropriate regulatory system. However, I would still think that the private sector is more interesting for me,” he notes. We asked Mr. Tabuashvili regarding his decision to join the RSM Company team. “When I made a decision to return to the private sector, I was thinking where I could apply my decades of working experience in the very best way. I considered RSM to be the most appropriate choice for accomplishing this aim. RSM Georgia is a representative of one of the top global networks, with incredibly high corporate culture. I strongly believe RSM will give me an opportunity to make use of my knowledge and experience. At RSM Georgia, we plan to offer to our clients the best possible solutions for tax and government compliance, based on in-depth and up-to-date knowledge of local as well as international tax regulations, while always acting with the highest level of integrity and concern for reputation,” he tells us. programming in Georgia based on Hungary’s experience joining the EU. Markus Hopfner, Deputy Director General of the Federal Ministry of Sustainability and Tourism of the Republic of Austria shared his country’s experience in implementing EU rural development policy. Minister of Regional Development and Infrastructure, Maya Tskitishvili, and Minister of Economy and Sustainable Development, Giorgi Kobulia, joined a panel with Dr. Sandor Vajda, Hopfner, and Nino Evgenidze, Executive Director of Economic Policy Research Center on a panel to discuss, in practice, how Georgia may be able to adapt EU standards and policies to its national context, and the challenges the process will introduce. Khatia Tsilosani, Deputy Minister of Environmental Protection and Agriculture, shared her ministry’s outlook on the new, integrated Agriculture and Rural Development Strategy (ARDS) beyond 2020. Surprising most of the audience, the ministry currently has no plans to include Local Action Groups in their strategy. Local Action Groups and the LEADER principle of bottom-up, grassroots rural development has been the central tenant of the EU’s ENPARD Program, a nine year, 179.5 million EUR support scheme. Under ENPARD, Local Action Groups, which bring together local government, private sector, and civil society representatives to create local development strategies and provide strategic policy guidance from a local perspective, have been established in 12 municipalities in Georgia. They join a network of hundreds of Local Action Groups across Europe. The Ministry of Environmental Protection and Agriculture plans to release the official ARDS Beyond 2020 in the coming months. irbnb has retracted its decision to remove holiday rentals listed in the occupied zones of Abkhazia and South Ossetia. The company, which allows customers to rent accommodation in 191 countries worldwide, had previously decided to remove listings in Georgia’s occupied zones, as well as the West Bank, as they considered the listings to be linked to the conflicts. “In applying the global framework of these disputed territories, Airbnb determined that the existence of the listings in these disputed territories has a direct connection to the larger conflict in the region,” read a statement by Airbnb released January 20.
six hours and costs approximately $25. Abkhazia was once one of the most popular tourist destinations in Georgia. During the Soviet Union, many tourists visited Abkhazia for its Black Sea beaches. With over 202,000 tourists to the region every year, it accounted for a 40% share of the Georgian Soviet Socialist Republic’s tourism market. that in November, when the S&P's next report will be published, Georgia's sovereign rating may increase even more. Kobulia said that since 2011, the company has not changed Georgia’s rating until now. "The positive assessment of S&P is related to the fact that they saw a fairly high economic growth in the country on the background of the recent developments in the region. They also positively assessed implemented reforms and said we have a successful and wellmanaged monetary and fiscal policy,” the Minister explained. To note, Moody’s credit rating for Georgia was last set at Ba2 with stable outlook. 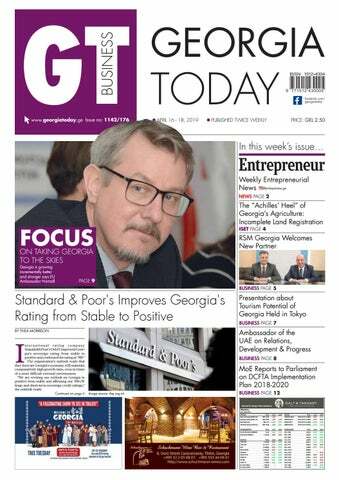 Fitch’s credit rating for Georgia was last reported at BB with a stable outlook. ithin the frames of the project ‘Georgia – Homeland of Wine,’ a presentation about Georgia’s tourism potential was held for the representatives of Japanese tourist companies at Terrada Republic / TMMT Hall, Tokyo. Representative of the Embassy of Georgia to Japan David Goginashvili introduced information about Georgian wine, history, culture and gastronomy to invited guests. The event was attended by the following companies: Intourist Japan, Toyota Tsusho Corporation, Turkish Air & Travel, Latera International, Europe Expres, and others. After the presentation, business meetings were held between representatives of the Georgian and Japanese sides, where future cooperation plans were discussed. The event was organized by LEPL National wine Agency, Georgian National Tourism Administration and the Embassy of Georgia in Japan. The project ‘Georgia – Homeland of Wine,’ organized by the National Wine Agency and Association ‘Georgian Wine’ is implemented in partnership with Sony Music Communication and TOPPAN. The exhibition combines unique archaeological exhibits and modern technologies, the concept of which is based on the uniqueness of Georgian wine culture. ments. 13% think such a practice does not exist. 51% of interviewees think that there is no proper investigation of corruption cases when they are dealing with high-ranking officials or influential people who have ties with the ruling party Georgian Dream (GD), while 42% consider the government, as a rule, covers up for people involved in corruption, and 31% think that the government discloses such cases. Regarding employment in the public sector, 31% of respondents said one needs to have acquaintances to get hired in public service. 28% and 19% respondents respectively listed education and professionalism/work experience as main factors for recruitment. The survey was commissioned by Transparency International Georgia and conducted by the Caucasus Research Resource Center (CRRC) from February 20 to March 5, 2019. With a total of 2,087 respondents being interviewed throughout the country, the representative survey has a margin of error of 2.3%. To note, in Corruption Perceptions Index (CPI) 2018, released by Transparency International in late January, Georgia leads Eastern Europe and Central Asia countries with its score of 58. Georgia has advanced its score by two points since last year, taking 41st place among 180 countries. In the ranking, 100 points indicate the lowest level of perceived corruption while 0 – the highest. Georgia’s CPI scores during the recent years are: 2012 – 52 points, 2013 – 49, 2014 and 2015-52, in 2016 Georgia was placed 44th with a score of 57 and in 2017 – 56 points and 46th place. for six months, to attract more investors and to establish themselves on the international markets. I would also like to emphasize the fact that the upcoming event is not going to be focused on the commercial sector but will be fully dedicated to the cultural sphere. In this case, Georgia has incredibly high chances and potential to achieve success, as this is a country with an ancient history and outstanding culture. At the fair, it will be able to mesmerize visitors with traditional dances, arts and dishes of the stunning, colorful cuisine and, of course, mineral waters of local production in addition to industrial and agricultural products. Georgia is successful in the tourism industry, and the Diplomat also focused on this fact. “Georgia has put a lot into the development of its tourism industry in recent years and has seen positive results come from it. It hosted more than 8 million tourists last year, which is an unimaginably high figure for such a small country. Expo 2020 will contribute to augmenting this number and increasing the desire of travelers to visit Georgia, as the fair is expected to see approximately 30 million visitors.” We asked the Ambassador to tell us more about the economic cooperation between the UAE and Georgia. “Enhancing the economic collaboration is paramount for the UAE, as well as for Georgia. The UAE represents a country which has already allocated investments amounting to more than $1 Billion in Georgia, which was certainly catalyzed by the brotherly relations of the two governments and their mutual aspirations for progress. The implemented investments include the launch of multiple hotel and shopping center chains, as well as the support of the retail business and real estate. There is a room of tremendous investment possibilities in other segments, such as export of the mineral water, as there is the incredible multiplicity of water resources in Georgia.” The Diplomat also shared his views regarding the strategic location of Georgia and the UAE. “Both the UAE and Georgia benefit from a strategic location which is one of the best factors for development. The UAE, which has developed infrastructure of Airports and Sea ports with high security measures, is located in the crossline of Asia and Africa and is few hours distance from the South of Europe. As for Georgia, due its location, it is the channel through Europe and Asia and its sea ports serve the whole Caucasus region. These factors make the country attractive for investors and tourists. With every year, Georgia is better prepared to handle its regional challenges, and to embrace its opportunities fate, their own potential and that of their country. With every year, Georgia is better prepared to handle its regional challenges, and to embrace its opportunities. And given that there is an almost national consensus on where Georgia should be heading, towards Europe, through further democratic and economic reforms, objectively, little stands in the way of Georgian politicians from all camps to unite around this objective, thus making sure that the trajectory set already some 25 years ago, becomes irreversible. We are now at a point in time when it is time to clear the last rubble from the tarmac and take Georgia to the skies! The Georgian version of this article was printed in the Georgian version of The Economistâ&#x20AC;&#x2122;s The World in 2019 edition. eorgian policymakers are proud of their country being #6 in the world in the Ease of Doing Business Index. It is, indeed, quite easy to do business in Georgia. Starting a new business takes literally only a couple of hours (on paper, that is), ranking Georgia #2 in this category globally. And all it takes to register a new property is one action and one day (Georgia is #4). Georgia is only #16 in paying taxes, but businesses should not be complaining. Georgian tax rates are rather low by international standards: 20% on personal income, 15% on distributed profits, and 18% VAT. Furthermore, inspired by Estonia, Georgia makes paying taxes easier by levying income tax on distributed profits (dividends) rather than on taxable profit. Though not captured by the Ease Doing Business methodology, Georgian companies have yet another advantage over their international peers: they don’t have to give a s*** about their clients and customers, whether it’s other businesses or unfortunate Georgian citizens. And judging by the experience of Ana and Davit, Georgia might be #1 in this aspect of the business environment. ANA, DAVIT AND THEIR NEW BATUMI APARTMENT In the fall of 2018, Ana and Davit bought a beautiful apartment on the 18th floor of Batumi’s Pushkin Twin Towers, as the project was advertised by the developer, DARBUILDING.ge. Large panoramic windows promised a great view of the city and the mountains. Transforming the concrete shell (“black carcass”) into a cozy home, required a lot of work, but this was a challenge well worth taking up. All was good (for a couple of months) until it wasn’t. Davit quickly realized that the building’s external walls were not properly insulated. The developer, DARBUILDING, promised to “look into the issue”. But while they kept looking – without doing anything – walls were getting wet, preventing Davit from starting the renovation works. “In the end, I decided to take a month off, and fix the wall by myself. I could not afford waiting any longer,” Davit tells me. But tragedy struck on the first day of Davit’s vacation on January 16, 2019: a strong wind gust at 90 km/h blew their large (9m2) panoramic windows out of their frame. In their apartment and that of their neighbors on the 17th floor. The windows fell down, crushing a BMW and a small cabin beneath. A similar incident had happened three days earlier, when a window fell out of the 14th floor of the building. Thank God, nobody died or was hurt in both incidents. Davit, his neighbors and the owners of the damaged property spent the rest of the day in the local police station, reporting the incident. The police never bothered to inspect the scene of the crime and merely transferred the case to an investigator in the central police office of Batumi. Batumi’s Pushkin Twin Towers. Prime location. Subprime construction quality and no accountability. its buildings commissioned by a businessfriendly city hall. What is good for the likes of Amiran Darchidze is presumed to be good for Batumi. Nobody seems to care about – and take responsibility for – the wellbeing and safety of Georgian consumers and citizens. AN EFFICIENT COURT IS THE BEST REGULATOR “If you could not get the government regulators to help you, why didn’t you take your case to court?” I ask Davit. “Don’t you believe in your chances of winning?” “I thought of it,” says Davit, “but decided this was not worth our time and money. First, we would have to pay at least 525 GEL for an expert engineer’s opinion. Then, we would need to hire an experienced lawyer. Ideally not from Batumi, but from a good office in Tbilisi. The litigation process would take about 2 years, with minimal chances of winning in the first instance, in the local Batumi court. We would most likely win in an appeals court in Kutaisi, but this would take another year. In the best-case scenario, we would be able to cover our costs for the window, legal services and engineering expertise. But 3 years is also sufficient time for the company to declare bankruptcy… “ I had no further questions for Dato. But I do have many questions (and a few suggestions) for Georgian policymakers. Kakha Bendukidze, the ideologue of Georgia’s libertarian reforms of 20042006, hated government regulators and inspectors. “The court is the best regulator,” he told me once. But, if courts take three or four years to settle a simple civil case, such as that of Davit and Ana, they can hardly perform the regulator’s role. Slow and dysfunctional courts cannot deter unlawful or irresponsible behavior on the part of fellow citizens and companies. They are equally bad for the “ease of doing business” (especially for small companies), and the wellbeing of Georgian consumers. courts can handle claims up to $10,000. Individuals may sue other individuals or corporations. If needed, they can use legal assistance, but are not allowed to be represented by professional lawyers. To get a hearing, one has to wait about 3 months, but cases are typically decided on the spot (or within a maximum of seven days), using a simplified, informal procedure. Importantly, decisions by small-case courts are executed just like any other court’s decision. * * * Rather astonishingly, the World Bank’s ‘Doing Business’ report ranks Georgia at the top of the world (#8, to be precise) on contract enforcement. Ahead of its neighbors. Ahead of OECD high income country average. Ahead of Sweden, France and Germany. Way ahead of Finland and Iceland. But based on what we know about Georgia’s justice system, something is fundamentally wrong with not only the Georgian business environment but also the (flattering) way in which the World Bank assesses it. Time has come to fix (or nix) the Doing Business Index and the reality it purports to describe. Eric Livny is Founder and President at Tbilinomics Policy Advisors and Chair of Economic Policy Committee at the International Chamber of Commerce (ICC Georgia). On 16 January, 2019, strong wind blew away two windows on the 17th and 18th floors of the building. in year-on-year trade. The value of Georgian exports was $826 million, a 12.8% increase compared to the same period in 2018, whilst the value of imports was $1.98 billion, a 4.7% decrease compared to 2018. In 2018, external trade accounted for 41.1% of Georgia’s total trade turnover. 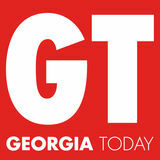 Georgia’s trade deficit amounted to $1.16 billion last year, meaning imports exceeded exports significantly. eorgian Business Ombudsman Irakli Lekvinadze says that the new tight banking regulations have affected sales of various business sectors, including companies employed in construction and retail trade. Lekvinadze stated that it is important to mitigate the new banking regulations because the negative effect of the regulations is already obvious in the hardware stores and other business sectors. “Sales of these companies have reduced by about 40-60%, and this was especially acute in the regions. The regulations also affected the construction sector," he stressed. The Business Ombudsman added that softening the regulations is necessary to prevent a dramatic influence on the business sector. The new banking regulations took effect in Georgia on January 1, 2019 meaning that people will not get loans from banks if there are no solid guarantees that they will be able to pay it back on time. in a number of countries, including Georgia. The risk insurance mechanism applied by the institution makes access to capital more affordable for investors and increases their interests regarding participation in the large-scale projects carried out in Georgia. by all four devices look the same, but when we find ourselves in the worst lighting conditions, the leadership of HUAWEI P30 Pro becomes even more noticeable, to the level that the competition no longer counts." HUAWEI introduced the new P30 series smartphones in Paris on March 26. With a completely updated, powerful and ultra sensitive camera system, HUAWEI P30 and HUAWEI P30 Pro drastically change the rules of photography. In the HUAWEI P30 series, we meet a camera system created with Leica, which offers the ability to shoot professionally through the latest sensors and automatic image processing techniques. the 4200 millimeter battery, Smartphone is the best friend for travel lovers. HUAWEI products and services are available in more than 170 countries and are used by a third of the world's population. There are 16 research and development centers operating worldwide in the USA, Germany, Sweden, Russia, India and China. HUAWEI Consumer BG is one of HUAWEI's three business units, mainly focusing on Smartphones, personal computers, tablets and cloud services. HUAWEI Global Network is based on 20 years’ experience in the telecommunications business and serves to provide innovative technologies to customers around the world. tles as products from Georgia recognized in the EU for their quality and value. Georgia is actively cooperating with relevant EU institutions to help open the EU market for the import of Georgian animal-origin products, he noted. Arveladze thanked the German International Cooperation Society (GIZ) for the support in developing Georgia’s export strategy, which is now focusing on the value chains of textiles, furniture and communication technologies for potential export to EU markets. Arveladze also briefed the parliamentarians and attending civil society representatives on issues of phytosanitary measures, customs, state procurement, environmental protection and other ongoing and planned reforms designed to bring Georgia’s internal standards more in line with Europe’s as part of the DCFTA. Establishing a regulatory system for industrial products is a key priority for the ministry, including changes in product safety and the adoption of technical regulations in industrial conditions. Another major area of work has been geographical indications (GIs). At their annual meeting in March last year, the EU-Georgia Sub-Committee on Geographical Indications approved GI protections for several products, including: Tkibuli tea, Machakhela honey, Kutaisi greens, and Akhalkalaki potatoes. decades are needed to see the geographic situation changed, constituting the largest geopolitical development in recent centuries. April as the Month of Stenocardia. Accordingly, our company Servie Georgia joins this initiative together with the Association for the Prevention and Rehabilitation of Cardiovascular Diseases,” said Servie Director Khetsuriani. “Our company will try to provide comprehensive information on the symptoms of the disease and its detection, and give advice what to ask the doctor in order to avoid a heart attack.” In terms of health economics, stenocardia is a big burden for the public, negatively affecting the quality of life and increasing by 1.5 times the risk of losing your job, three times the chance of losing work-capabilities and four times, depression. Despite these alarming indications, stenocardia remains outside the control of doctors. It means that many patients do not take appropriate action and, as a result, their health conditions worsen. Recent research has shown that in 43% of patients with coronary artery disease, stenocardia is not diagnosed. 44% of patients with angina are not treated with enough medicinal therapy. These facts confirm that important efforts are needed to improve the treatment of stenocardia both on the side of doctors and patients. Micrograms will be a headliner on June 21, Pixel on 22 and Freedom Fighters on June 23. The Singer Stage joins Tbilisi Open Air for a second year. During the day, Singer's is dedicated to acoustic projects, and at night to Jazz Foundation artists. At this stage, two newcomers will be presenting their outstanding projects on June 21. On the night of June 21, guests will be able to listen to Dinis Virsaladze's quintet. On June 23, the Singer Stage will be taken over by Rezo Kiknadze's sixtet. Tbilisi Open Air was created in 2009 on the initiative of the Altervision Group. Achiko Guledani, Vakho Babunashvili and Beka Japaridze are the authors of the idea of the biggest music festival in the Caucasus region. In 2009, the first day of the festival was held on Shardeni Street and continued on the territory of the Old Hippodrome. In 2016, Tbilisi Open Air built its “base” at Lisi Wonderland on Lisi lake. The Festival has been twice winner of the National Tourism Awards, Welcome to Georgia, in the category of musical event / festival. In its more than 10-year history, Tbilisi Open Air has hosted artists such as Deep Purple, Placebo, DDT, Archive, Tricky, UNKLE, Sevdaliza, Tom Odell, and Roman Flugel: a total of nearly 1000 artists! and around the world. Another special guest was Gitis Kirvela, Member of the Lithuanian Hemophilia Association, who shared her experience with Georgian patients in a speech titled, "life without bleeding". ferers, as well as their families, friends and caregivers. Today, the management of hemophilia is simpler than even a few years ago. The focus is on prophylactic treatment that provides a way to not only stop the existing bleeding, but to make bleeding occur less frequently. Prophylactic treatment allows patients full integration into society and to improve their quality of life. The treatment of hemophilia in Georgia is financed by a state program to ensure patients do not die from bleeding caused by hemophilia. However, prophylactic treatment is not yet available and joint work is ongoing to solve this problem. Information about the disease: There is a myth that hemophilia is a "royal disease" and people suffering are associated with royal branches. The myth comes from the fact that Queen Victoria was the carrier of the hemophilic gene, and accordingly her children suffered from it. Because of the lack of information on hemophilia, the myth was spread that the disease came from royal families. 397 people suffer from hemophilia and other bleeding pathologies in Georgia, with a worldwide statistic of one in every 10 thousand men. Nowadays, according to the World Health Organization, 400,000 people live with this disease in the world. Today, the management of hemophilia is simpler, there are already modern possibilities to diagnose and detect this disease at the earliest stage, with prophylactic treatment able to give positive results for patients.